What makes a murder mystery party an effective team building activity? To be effective, your team building activity needs participant buy in, it needs to allow staff to build their skills in a safe environment and in an ideal world the activity is fun as well. Our murder mystery team building activities follow these principles and help to build these qualities, all while having tons of fun. Murder mysteries are naturally motivating so there is your buy in. Working in a small teams your staff will have a great time as they practise these skills. Because your team is having fun they feel safe and relaxed which means they can bond and get to know each other. Murder mystery parties are great team building activities. Your staff will work in small teams of detectives to solve a tragic crime. It is through clever sleuthing and puzzle solving that they will be able to close the case on this one. The team members can assume a variety of team roles. Each individual plays a small part that contributes to the overall team effort. At the start of the party a team member will get murdered. GASSSP! But never fear they then become a very important part of this team building activity. If you can handle a night of murder you can handle our team building activities. Your staff will enjoy solving the crime in a small team of 5 or 6 working closely together. Often the roles are decided by the group. You will have chief scribe, spokesperson, spies and other important roles on the night. Your staff will need to work together to work out who the murderer is. Of course the murderer is lurking around at the party but due to the horrible nature of the crime they can't remember committing the act. We have had more than 100,000 people participate in our murder mystery parties. There is something about a murder mystery party that everyone loves. The team work, the competitive element the race to the top, the costumes and the excitement of participating in murder is really fun. After a while your staff can get a bit sick of the same old team building games. Fantastic team building activities need to be exciting and really capture people's imagination. Team building is essential if you are going to create a highly effective team and as the famous saying goes "a team that plays together stays together". Our murder mystery games are the perfect idea for your team building activities. Thousands of companies have enjoyed our team building activities and we have literally hundreds of thousands of happy customers that have run these team building murder mysteries. We run these activities in Perth, Adelaide, Melbourne, Hobart, Sydney, Canberra, Newcastle, Brisbane, Gold Coast and Darwin. Book a murder mystery party for your team building activity and you will get our 100% satisfaction guarantee. The games are also very fun so they really bring out the competitive spirit of your teams. At the end of the game one team is deemed the winner and so this gets everyone motivated and fired up to compete for the glory of being deemed the best sleuths and winning the best sleuth award. As far as team building activities go a murder mystery team building activity is an awesome idea. You can run our murder mystery parties at your workplace or hire a venue. The choice is yours our games are adaptable to any situation. 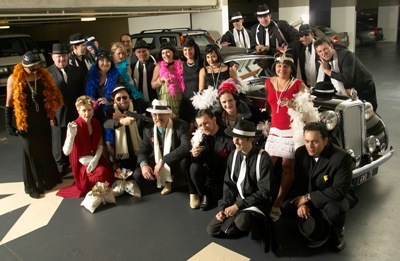 Just some of our murder mystery party clients! Living Way Christian Network Inc.